Attendees will spend a substantial amount of time in the topical track they choose at the Summit. This will allow attendees to dive into the topics presented in the tracks, identify barriers that exist, and brainstorm ways to address them, while also recognizing and celebrating successes that have occurred in these areas. This ten minute documentary examines the need for and challenges of creating vibrant local food systems in Montana. University of Montana graduate students in the Environmental Studies program attended the summit as part of a research project to examine the summit’s participants, processes, and products. Their goals were to understand substantive ideas about the local food and agriculture system and to observe the processes by which these ideas were generated. Neva Hassanein, professor of environmental studies at the university, has compiled their reports, which can be viewed here. University of Montana students Douglas Simpson and James Drysdale talk with Gov. Steve Bullock and other attendees about goals and strategies for boosting the state’s economy through sustainable and value-added ag production during the Governor’s Local Food and Agriculture Summit at Montana State University in October 2016. Nine years have passed since former Governor Brian Schweitzer convened the last Governor’s Local Food and Agriculture Summit. At that time, one major topic was how more of the food grown and raised in Montana could be used in the state to benefit our communities. An incredible amount of work has happened on that front since the last summit. There is, however, plenty of work that still needs to be done. Montanans caring about these issues will have another chance to come together, share information, and strategize about the next 10 years of working to build the state’s food economy. 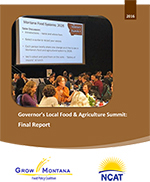 The Grow Montana Food Policy Coalition is working with other partners, including the Montana Governor’s Office, Montana Department of Agriculture, and Montana State University, to plan the 2016 Governor’s Local Food and Agriculture Summit. The summit is structured around topical tracks. Attendees will be asked to pick a track and stay with it for a good part of the summit, so they can take an in-depth look at the topics, identify challenges that exist, and brainstorm ways to address them. The tracks will be a mixture of panel presentations, small group discussions, and attendees prioritizing next steps. All of the tracks will report out their top recommendations at the summit’s conclusion. The information about the 2016 Summit found on this website will continue to be updated as planning continues. Please check back often for the most up-to-date information. We look forward to seeing you in Bozeman in October!